“2013 Silver Winner Golden Piwa Awards" BEST IN HOSPITALITY! 'The Library' refers to the original bach on this property, a small relocated country library. This now serves as a characterful sleepout and sits behind the main bach which is located beside an estuary. The large section is quiet, bush-clad, bird-filled and has superb inlet and mountain views. The bach is private and open plan - think designer retro-pacific styled tramping hut! Beds are in the loft and on the ground floor with no doors between. The bach's size, character and proximity to stunning beaches help make it a wonderful holiday destination for couples or small families. There is great mobile phone reception at the bach. Extra features include nearby migratory godwits and other wonderful bird life, including little blue penguins who are rarely seen but often heard and nest under the library sleep-out or wood pile. Plentiful cockles and pipi are a short stroll away at low tide. There are also a superb selection of natural history, children's and other fiction books, a large record collection, gas hot water and stove top, a trampoline, 3 kayaks, 1 bike, an outside bath and a composting indoor toilet. 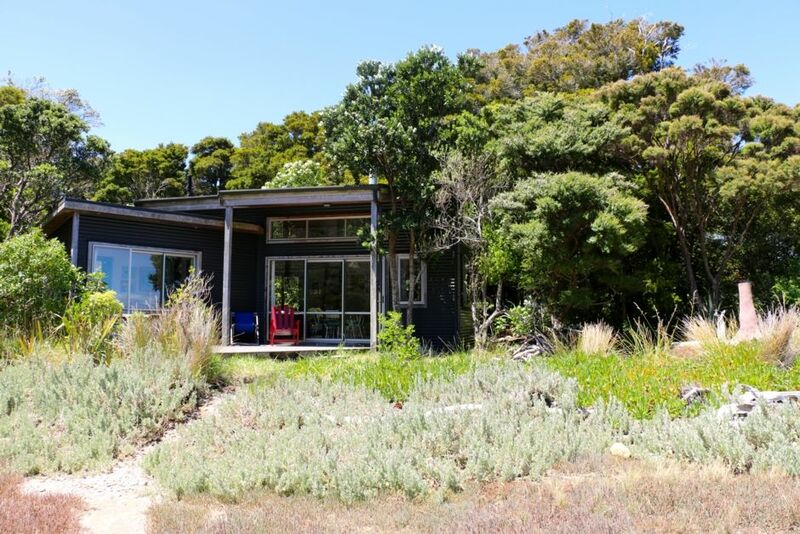 The bach is a few steps away from a safe swimming beach and in 2006 won an NZIA Resene Local Award for Architecture. Please email me for more details, including making payment via direct credit. For every night The Library Bach is booked, a $5.00 donation will be made to the Nelson ARK, a Charitable Trust. The Nelson ARK rescues unwanted and abused dogs and pairs them up with young people who are perhaps losing their way, for an eight week training course. This combination has proven to be truly transformative for the lives of both the young people and the rescued dogs, and has repercussions throughout the entire community. So far The Library Bach has raised over $6,000.00 for ARK. Find out more about The Nelson ARK on their website and which is unable to be referenced here! A minimum of four nights applies for bookings during NZ school holidays and a minimum of three nights applies for NZ long weekends. Otherwise a minimum of two nights. Rental is for a maximum of 4 people. Each additional adult guest per night is $20.00 and each child is $10.00. If you do not have the time or inclination to clean the bach before you leave, cleaning can be arranged for $50.00. Cotton sheets and towels are also available at NZ$20.00 per person. Inlet, with main beach a few steps away. Extra features include nearby migratory godwits and other great birdlife, including resident penguins. The bach contains natural history and fiction books, a fabulous 1970s-90s record collection and a record player, gas hot water and stove top, a trampoline, 3 kayaks and lifejackets (2 adult, 2 child), 2 bikes (with helmets and reflector vests), an outside bath and a composting indoor toilet. Wood is provided for the log burner that keeps the bach cosy during the colder months. A few steps from a safe swimming beach, the bach has superb inlet and mountain views. During very high tides the water reaches the edge of the section (as per the web site pic). Very peaceful and stunning location. We enjoyed our stay very much. Thanks Anna, we'll check in again at some point. Thank you for sharing The Library Bach with us. It was the perfect place to celebrate our 20th Wedding Anniversary. Wonderful spot! Such a great place with a lot of nice touches. Would love to return one day. Thoughtful and responsive host. Fabulous location; utter peace and tranquillity on the edge of the estuary. Bach is spacious, very comfortable and delightfully decorated. Thanks Anna! A fantastic place to stay if you like being surrounded by native bush and the ever changing outlook over a tidal estuary. Just a few metres to the other side of the peninsula to a sandy safe tidal beach. We enjoyed the company of a solitary white heron and lots of gulls, paradise shelducks, oystercatchers and pied stilts. Unfortunately just too late in March to see the migratory birds. The Bach itself is well equipped and reasonably comfortable. Lots of books, games and record collection for indoor entertainment . Kayaks provided, bring fishing gear for snapper, kingfish etc or just dig for cockles at low tide.